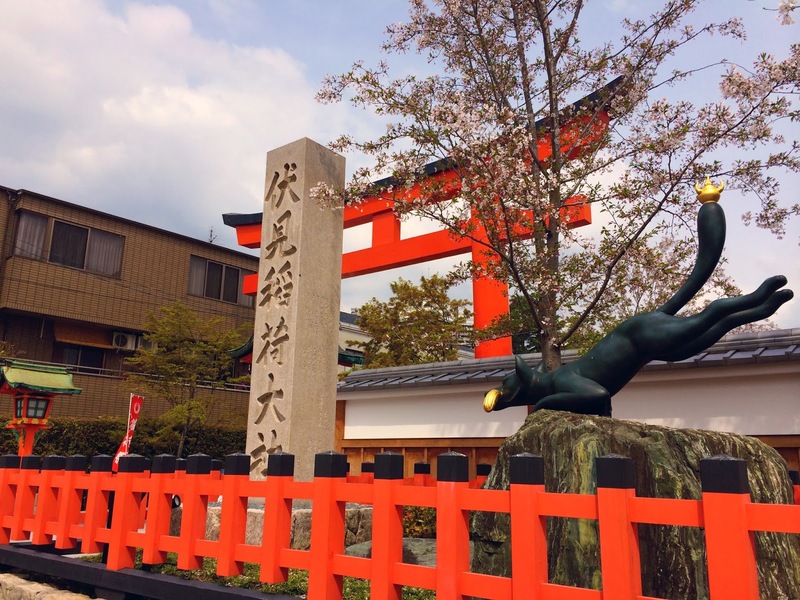 JAPAN 2015: Day 6 - Fushimi Inari Taisha and Nishiki Market. April 12th, 11AM - Kyoto Station, Kyoto. 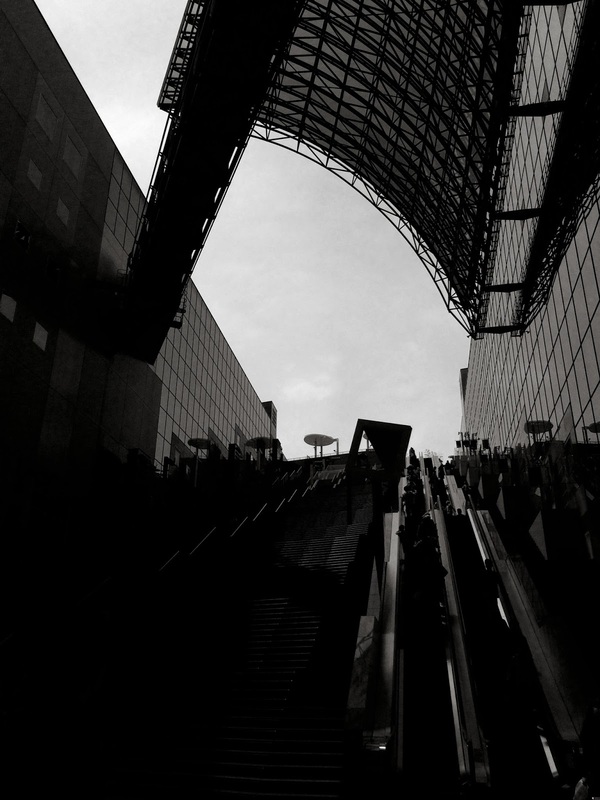 An architectural masterpiece of glass and steel, Kyoto Station is one of Japan's largest building. 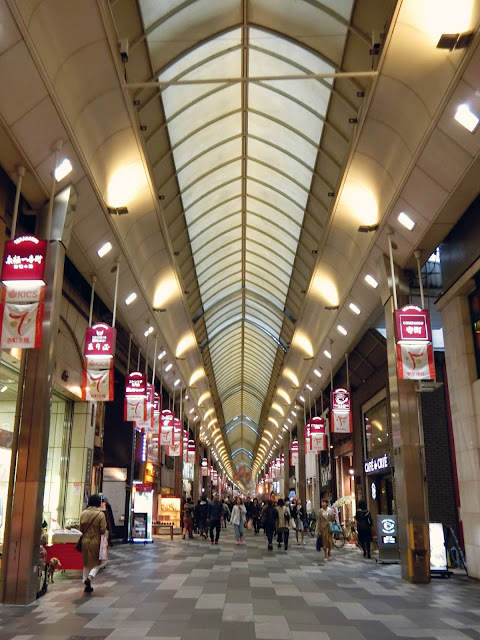 More than a station, this 15-story roof is also home to a shopping mall, hotel, cinema, a 13-floor Isetan department store, and government facilities. It's easy to feel tiny in here. 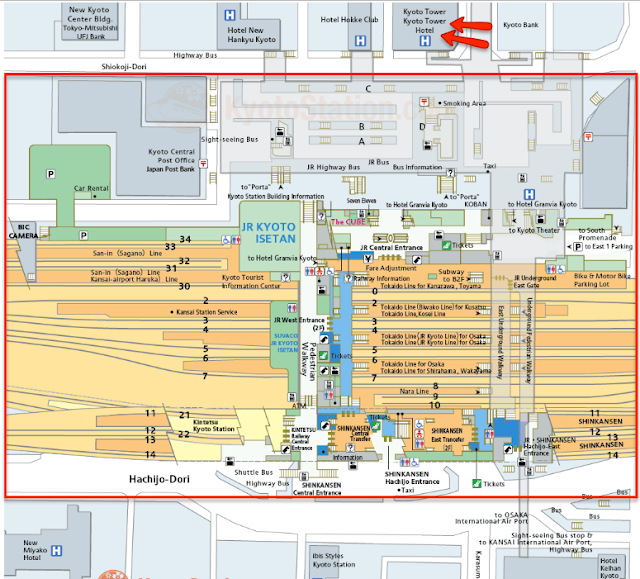 Spot the Grand Stairway (right next to the never-ending escalators). 171 steps, a distance of 70 meters and a height of 35 meters. The locals even have an annual race event on the stairs. Want to try sprinting up the stairs yourself? Yeah well, mm that sounds nice but.. no thanks. Can see the Kyoto Tower from here. 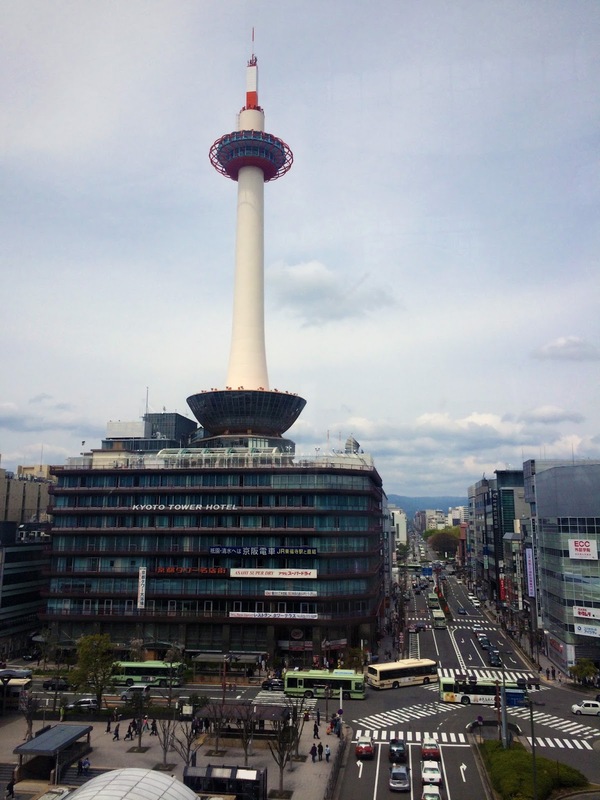 On the 10th floor of the building is Kyoto Ramen Street (Kyoto Ramen Koji). Sounds good already? 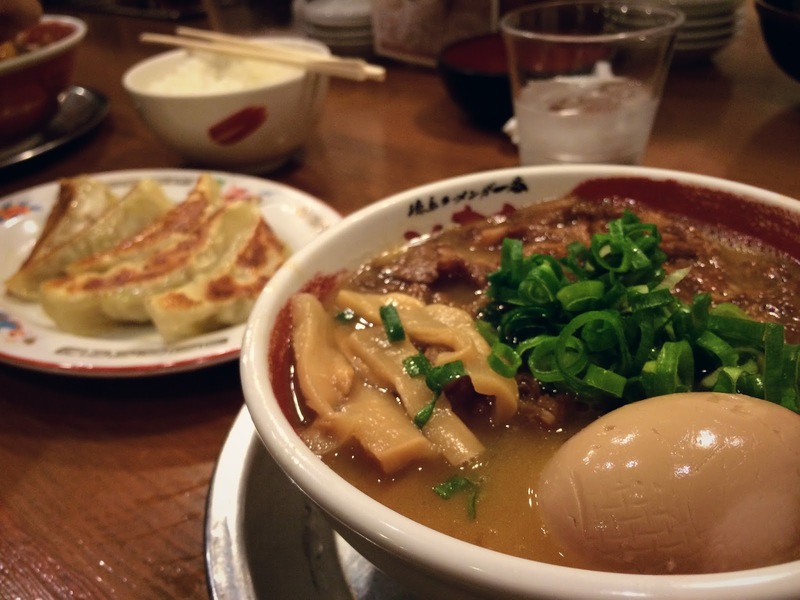 Some may call it a ramen "theme park", as the entire place is filled with ramen shops! You can find all the different regional varieties of ramen here, from north (Hokkaido) to south (Kyushu). Right outside the restaurants are vending machines. Don't worry, they don't dispense ramen. 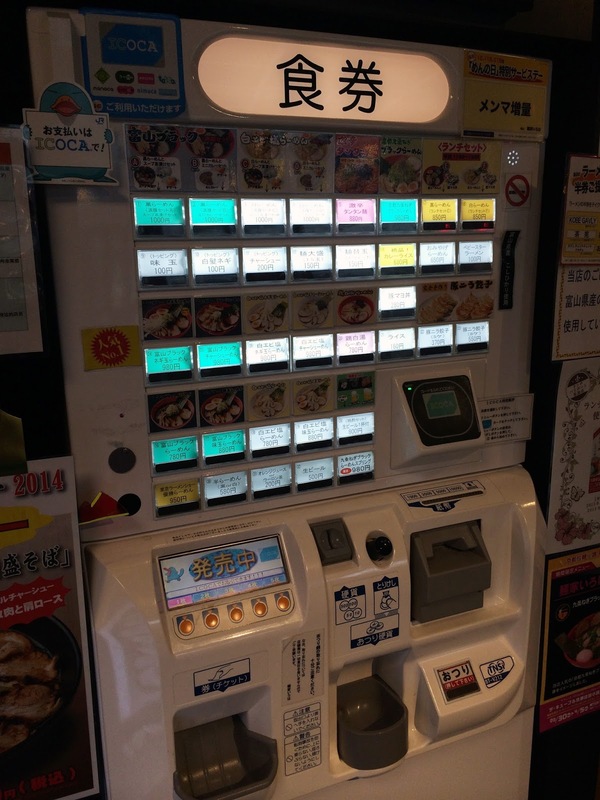 Using the machine, select food/drink item that you want - some even have combo meals. Thereafter, insert money and food/drink coupon will be issued. Now, find a seat in the restaurant and pass the coupons to the restaurant staff. Don't go buying coupons from Restaurant A and use them in Restaurant B. Each restaurant uses their own machine, so choose a restaurant first before buying coupons. April 12th, 1PM - Fushimi Inari Shrine (伏見稲荷大社, Fushimi Inari Taisha), Kyoto. 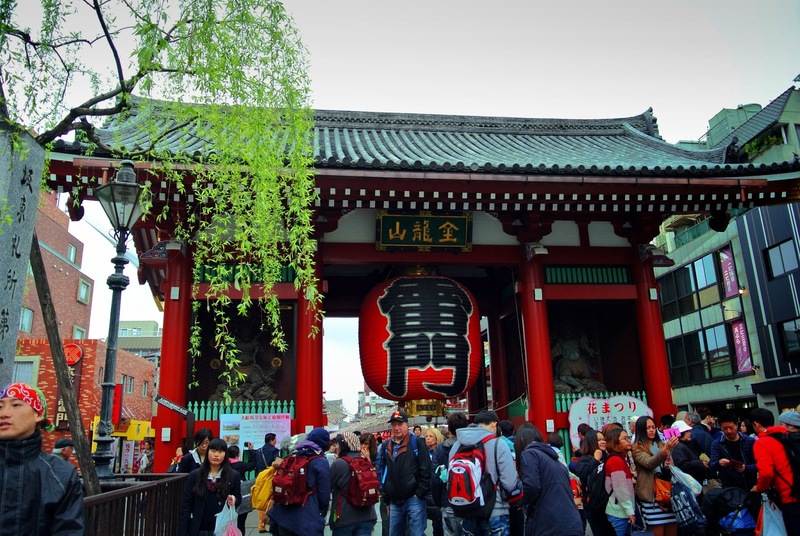 Fushimi Inari Shrine is just 5 minutes by train (from Kyoto station) and another 5 on foot. This is one iconic place that you must have seen at some point. You know, the one with lots of "red gates". 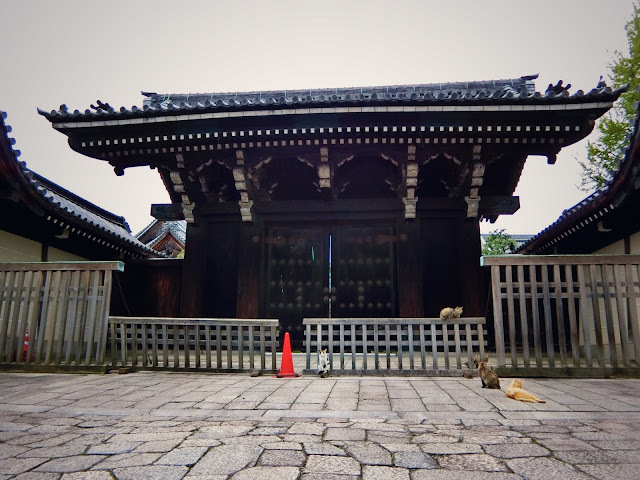 This shrine is dedicated to Inari - the god of grains (but I think we're more familiar with Inari the sushi), and you'll find many stone statues of foxes here, as they (foxes) are considered Inari's messengers. Another fox and a peek at the many "red gates" behind. The gates are called torii, which significance I've explained previously in this episode. 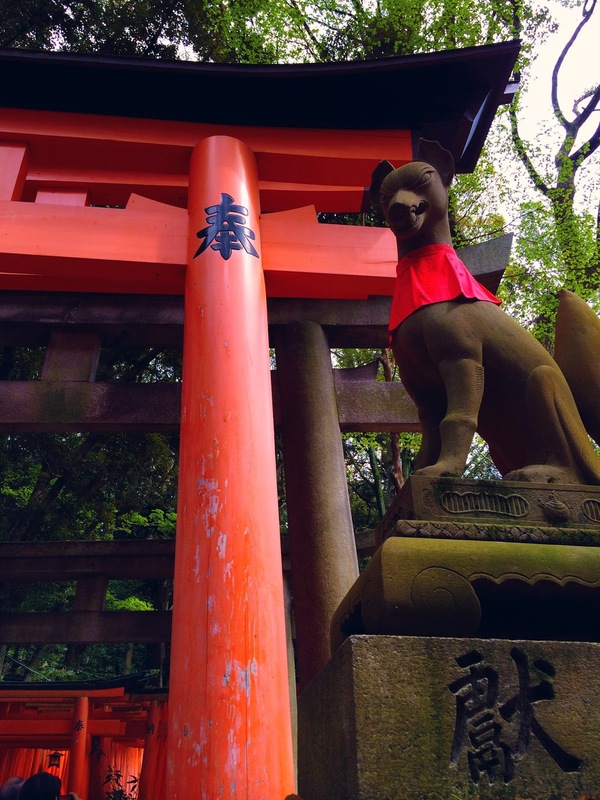 Also, the color is actually vermillion rather than red, and is said to have the ability to keep evil spirits away. 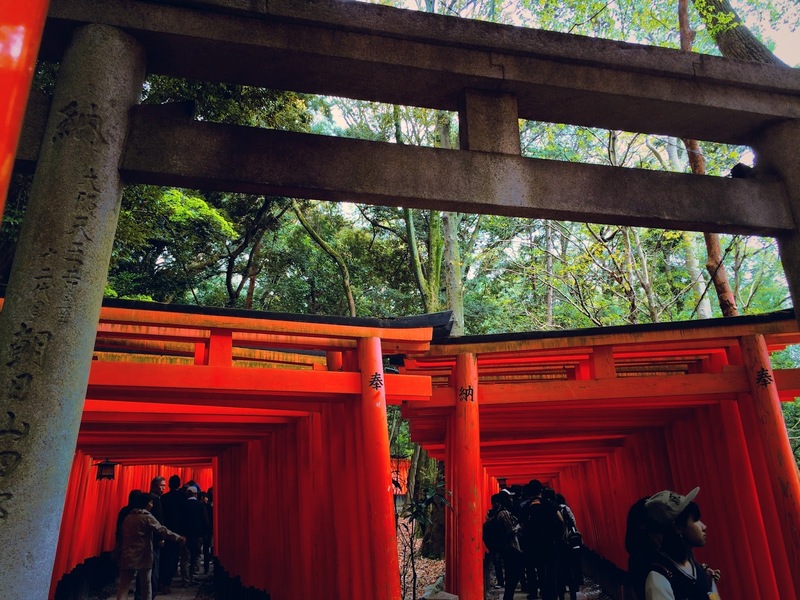 The Senbon Torii - entrance to the torii-covered hiking trail, thousands of them. 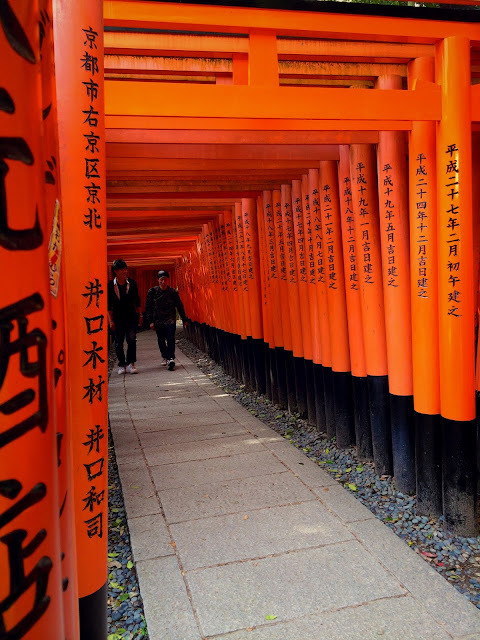 These torii are donated by individuals and companies as an act of giving thanks and wishing for prosperity. You want one? You can! 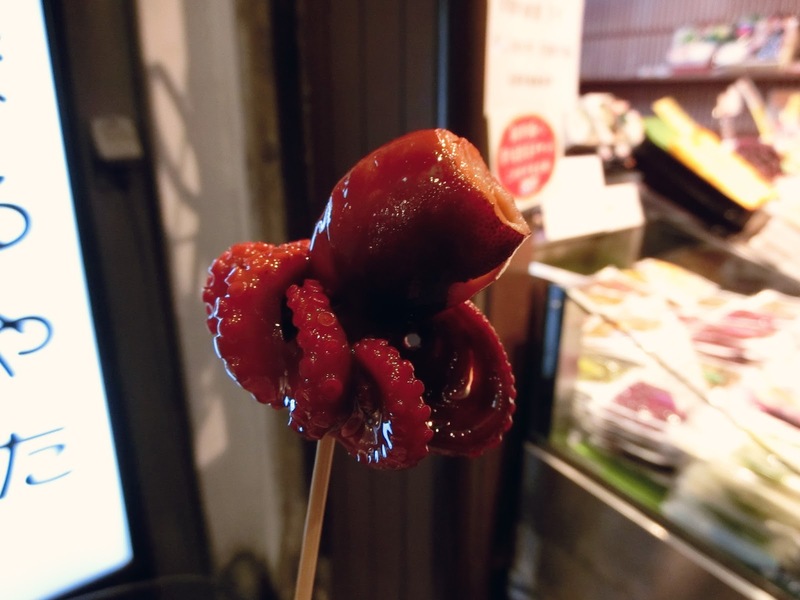 It's just well, you know, 400,000 ¥ for a mini one, and about 1,000,000 ¥ for a large one. 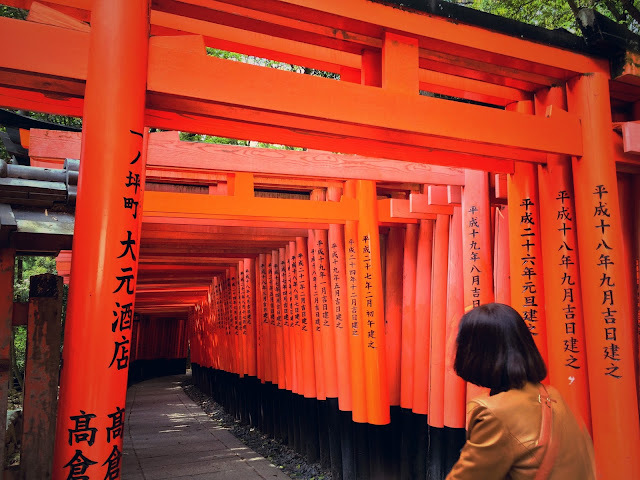 There are over 10,000 torii here! The inscribed words are actually the names and addresses of donors. 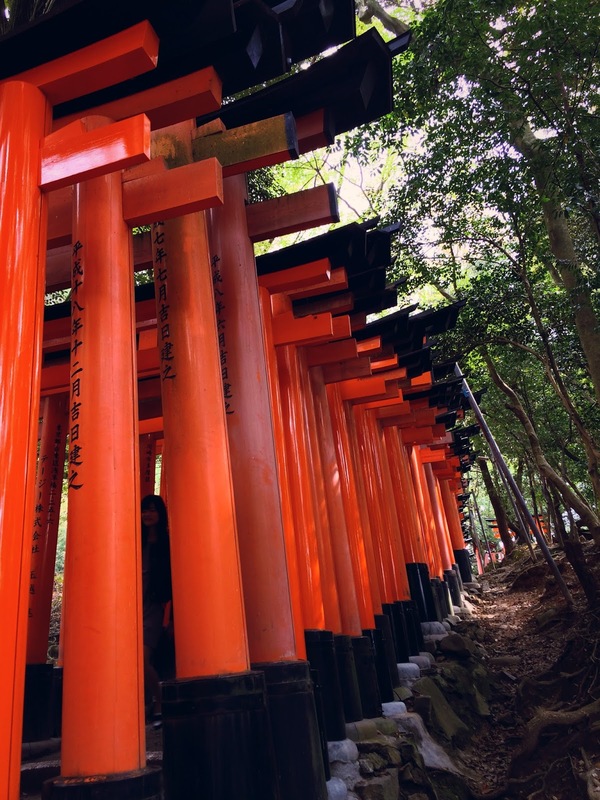 This is the closest I get to capturing a photo of the torii without human interruption. 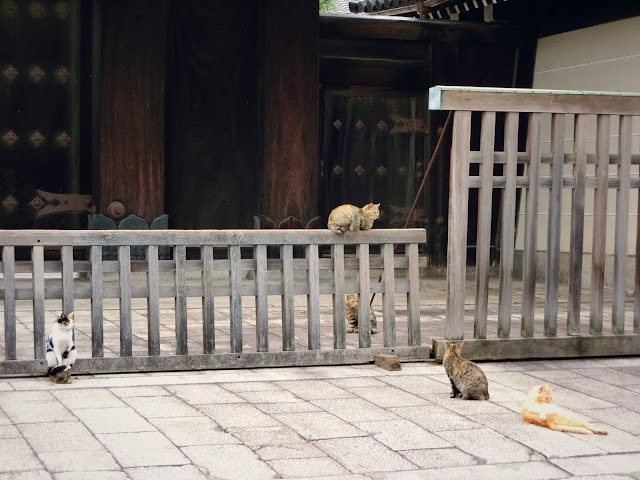 Aih... lady.. why.. ＼| ￣ヘ￣|／ Well, you can always Google Image if you want to see more "stock" photos of the place. 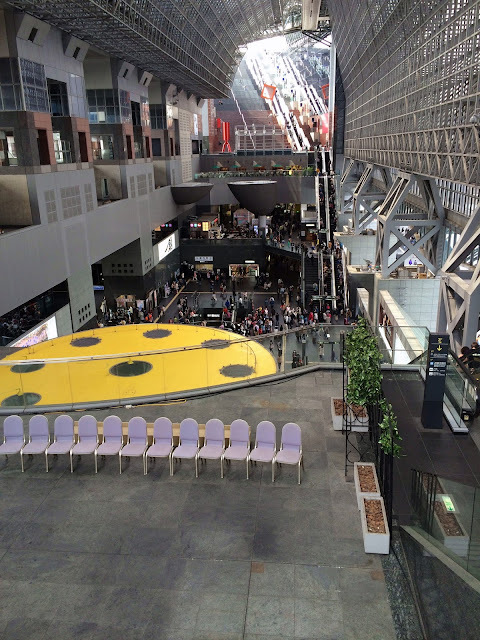 April 12th, 3PM - Bic Camera, Kyoto Station, Kyoto. Now, back to the station. Decided to drop by Bic Camera to get a new camera or lens. Despite its name, it sells more than camera. 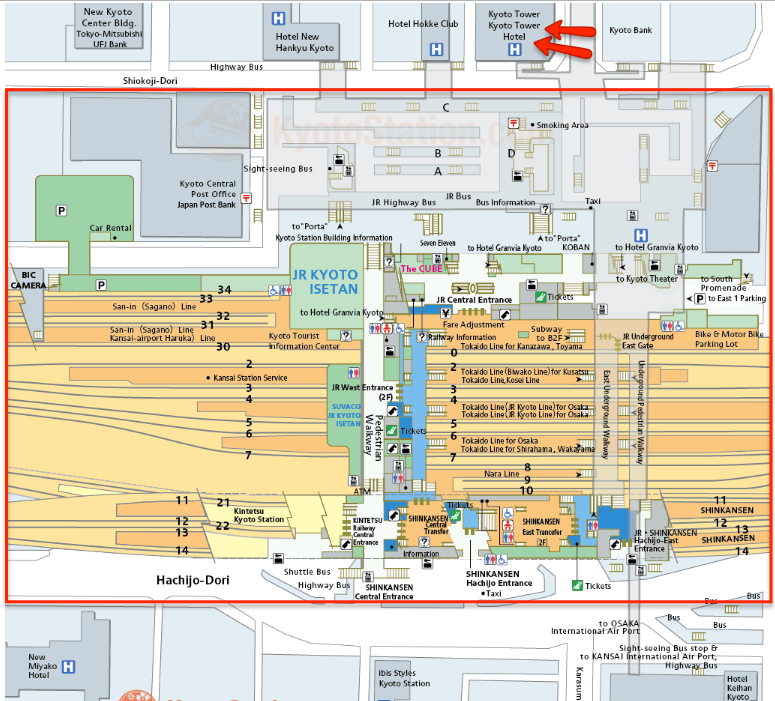 You can find whatever electronic goods and appliances here. Since it's tax-free for visitors, some of the prices are damn good! 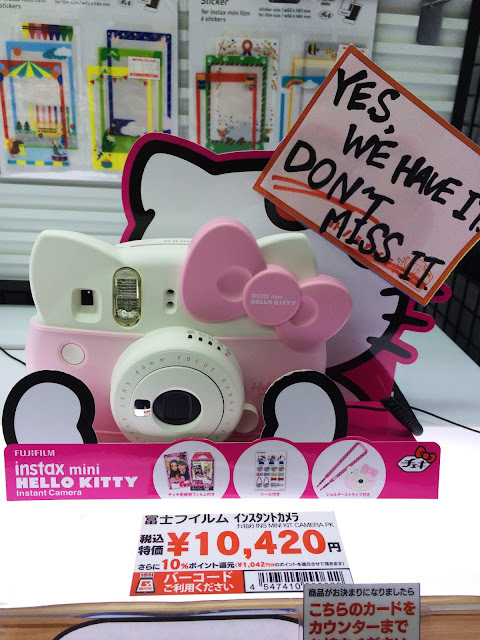 I found my next camera! Ohohohoho, they have it! How can I miss it! The price shown above is tax inclusive so just do the tax-free price calculation yourself (or look at the finer print, they stated the refundable amount). It's about MYR360 after conversion. Bear in mind that this is the price in 2015, so if you're visiting recently, it's even cheaper (provided your home currency hasn't dropped)! Oh and I'm just kidding, I didn't get it. I went to see the Nikon lenses first but they were rather pricey (typical lens prices) and I was on a budget ok. So I went looking for alternatives, perhaps just a compact one rather than the fancy schmancy interchangeable lens kind. Ta-da! Say hello to my new companion! 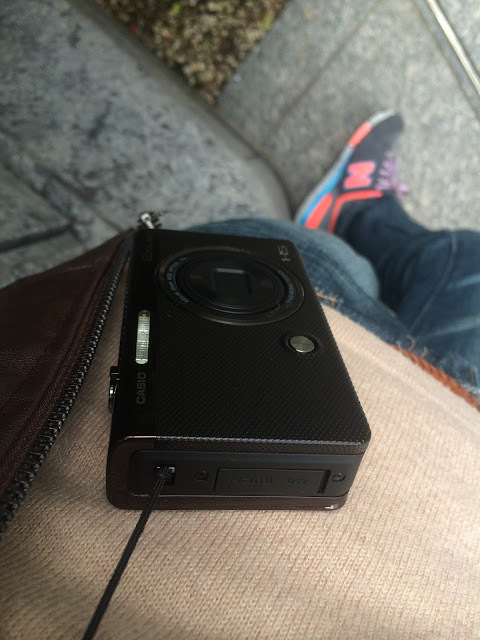 It's a Casio ZR55 and costed me about MYR800+ after conversion. Cheap cheap! I call it the bimbo cam because it's made primarily for selfies. Zoom in on the group of neko. 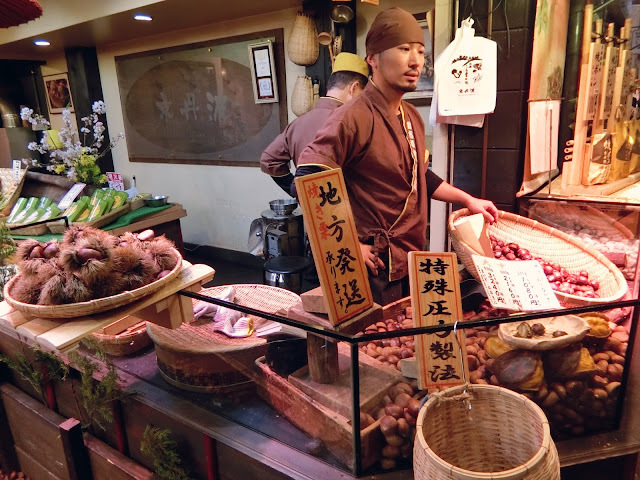 April 12th, 5PM - Nishiki Market(錦市場, Nishiki Ichiba), Kyoto. 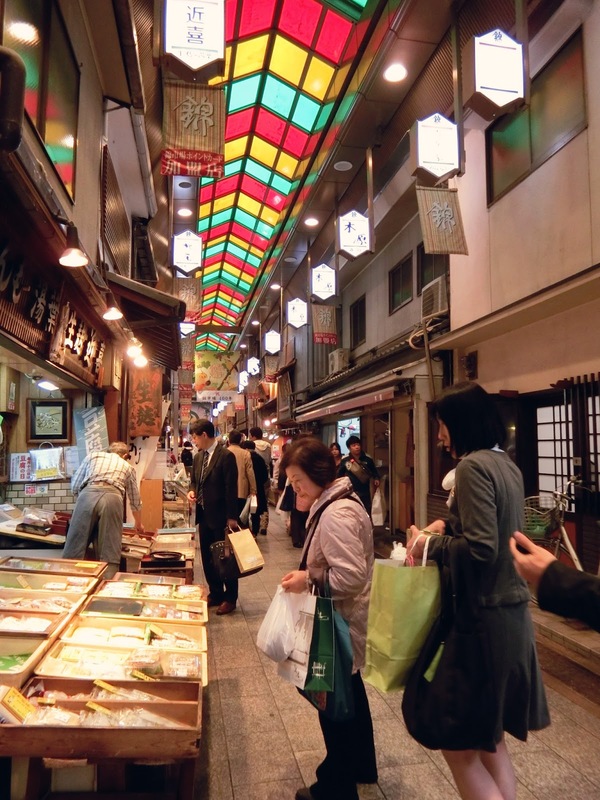 Nishiki Market, also known as Kyoto's Kitchen, is the largest traditional food market in Kyoto. You'll see plenty of locals here - shopping for cookware, fresh ingredients, seafood and such. You'll also see lots of tourists - sightseeing and purchasing street food and other small items. It closes around 5.30PM, so some shops were already closing when I got there. Still rather lively nevertheless. 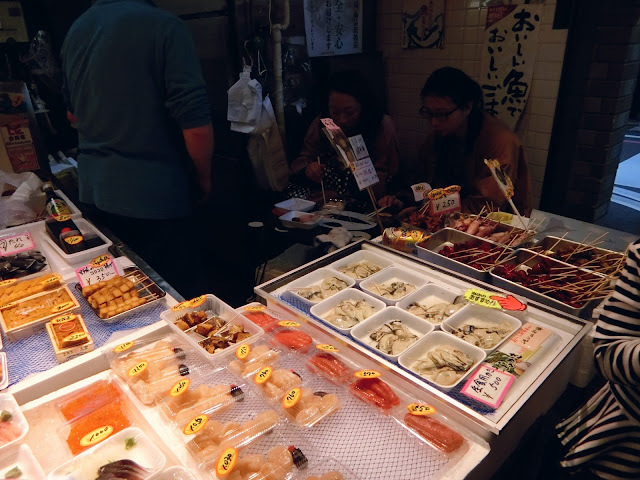 However, if you really want to experience the hustle and bustle of this market, visit early in the day and not on Wednesdays (that's when most shops are closed). Some were shopping for dinner perhaps? Chestnuts! The market smells of many things and this is one of them. A shop with street food, which you can have there and then. Of course I must have some! 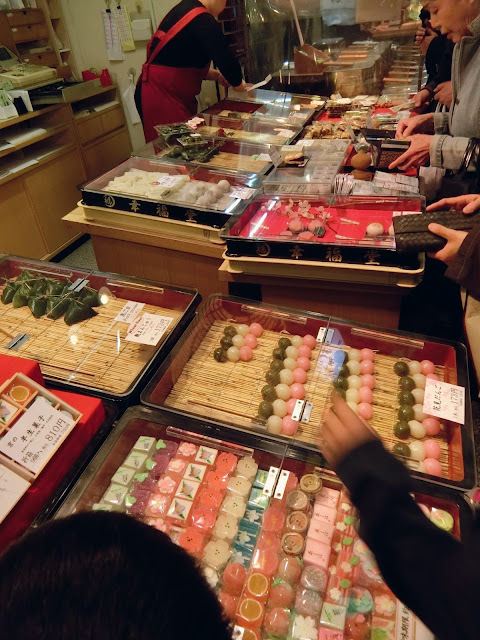 Sweets shop. Everything looks so good! Umm can I have.. this, this.. this, this, that, this, ALL! Ok I'm not that crazy yet. 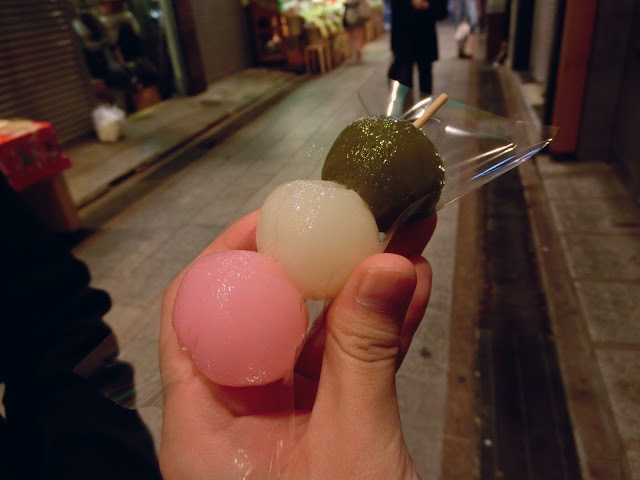 I bought just a few, and had this dango on the spot. 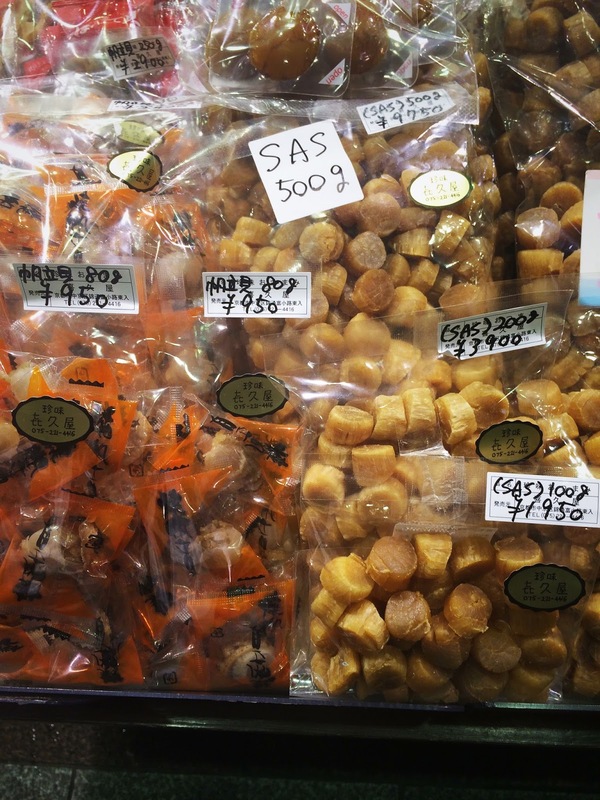 Dried goods! Mmm myam myam those scallops are pretty huge! It was getting dark and that means.. dinner! Thankfully, there is a tried and tested food/restaurant street (the one near Shijo Dori) walking distance from Nishiki Market. 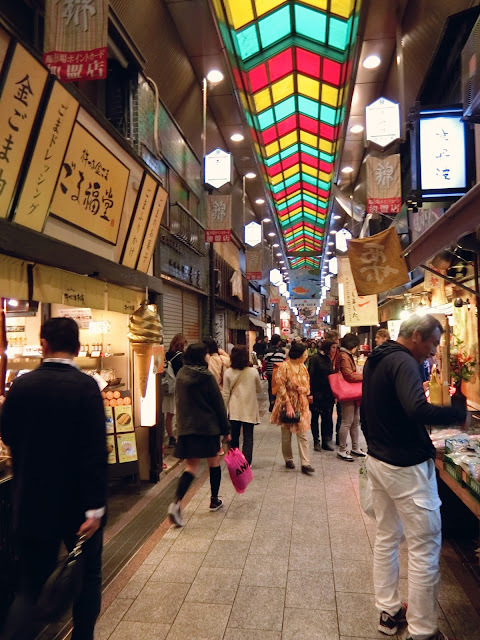 On the way to the yumyum street is Teramachi Dori, where you can do some non-food shopping. Plenty of clothing stores here! 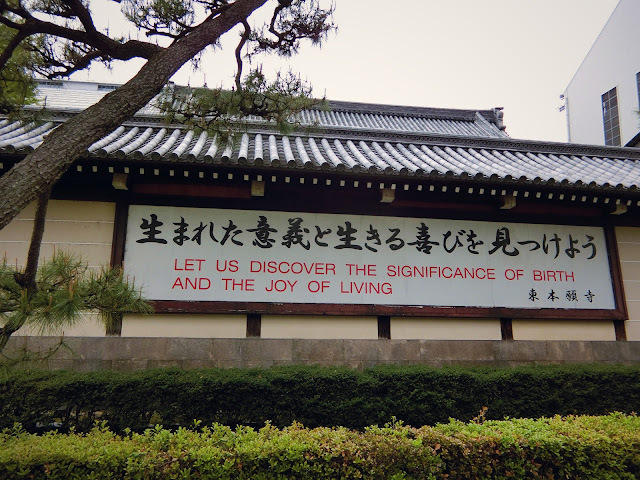 No shopping for me, was just walking hastily to Shijo Dori. What yumyum street? 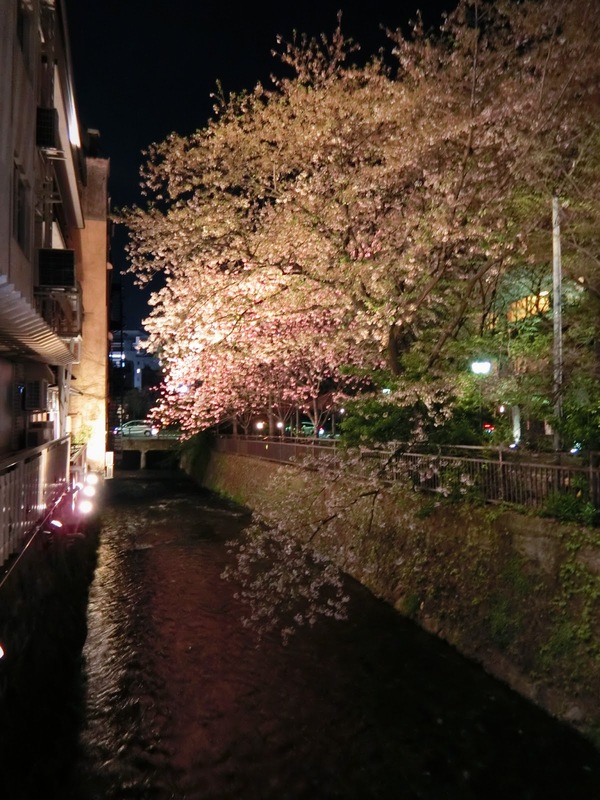 Neh, you know, the sakura food street from this episode? I've finally identified that street. Or rather, streets. They are Nishi-kiyacho Dori and Kiyamachi Street. So yeah, went strolling on those beautiful streets again. 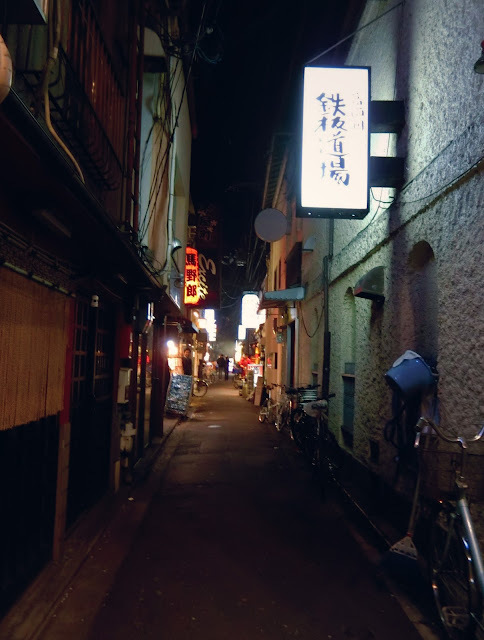 Even explored the mysterious-looking smaller alleys. 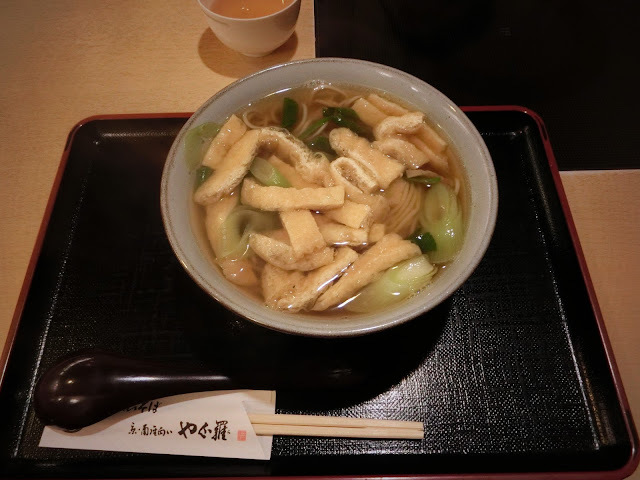 Really wanted to have another meal there (omg the thought of the cold soba I had the first night here.. ♨(⋆‿⋆)♨) but somehow ended up on the main street of Shijo Dori (regrettably), the hub of franchises and atas shopping places.